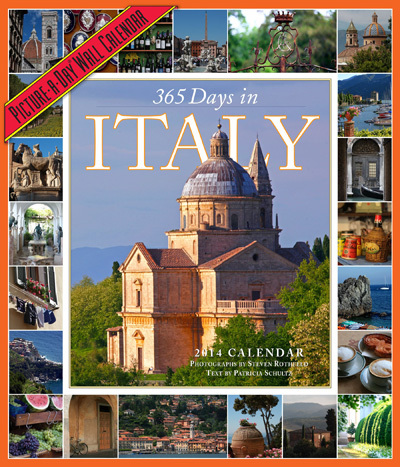 This season, we invite you to prepare for 2015 by entering our end of year holiday contest, where you can win a copy of The 365 Days in Italy Wall Calendar for every day between the 12th and the 24th of December. This contest will be running simultaneously on Twitter and Facebook, so be sure to follow us on both. One entry per social media account will be allowed for eligibility, so if you reply to us on both questions, you'll be entered twice! We will post one question per day, and all you have to do is answer the question to enter! If you are on Facebook, just answer with a comment on the post. If you are on Twitter, just reply to us with your answer. We can't think of a greater way to start your days in 2015 than with a lovely image of the Italian countryside, so if you agree, enter to win! We'll be choosing winners at random every night, and all prizes will be mailed out once the contest is over, just in time for you to begin your new year with a bang!